In New Jersey, bagels are an institution. The economy could run on bagels alone, it sometimes seems. That’s why narrowing the bagel shops down to just ten of the best is nearly an impossible task. Don’t worry—we’re up to the challenge. Below you’ll find 10 of the absolute best bagel shops in the entire Garden State. The Bagel Nook in Freehold, New Jersey, serves fantastic bagels, sure, but their true claim to fame is in the micro batches of cream cheese. The flavors are super unique, and include tastes like birthday cake, jalapeno cheddar, and maple bacon. The Bagel Nook has been featured in Food & Wine, Buzzfeed, Glamour, “the Today Show,” the Daily Meal, and more. Try the overloaded cocoa puff bagels, overloaded Cheetos flaming hot bagels, or the overloaded fruity pebbles bagels, among many more. Alfa Bagels in Randolph, New Jersey, serves hand-rolled bagels dipped in water. Alfa boasts that they make the biggest bagels in the country. 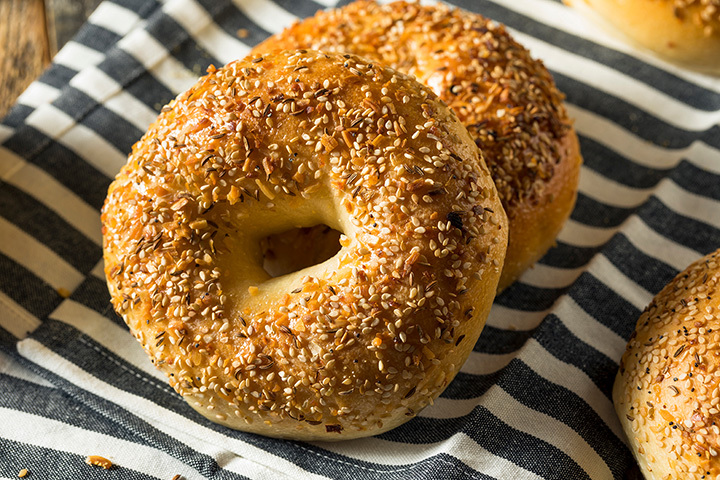 Bagel options include plain, poppy, sesame, cinnamon raisin, egg, onion, garlic, blueberry, whole wheat, pumpernickel, salt, and everything, along with almost twenty different kinds of toppings. The rest of the menu includes breakfast sandwiches, omelets, desserts, and lunch sandwiches. Gem’s House of Bagels have six locations throughout New Jersey, including two in Hazlet, one in Keansburg, Middletown, Port Monmouth, and Belford Junction. Their daily menu includes plain, poppy, sesame, everything, salt, egg, cinnamon raisin, pumpernickel, blueberry, French toast, bialy, and many more bagels. The gourmet cream cheese includes vegetable, scallion, walnut raisin, lox, and jalapeno. Breakfast and lunch sandwiches fill out the menu, along with bakery items. Jersey Boy Bagels has an extensive menu with 14 unique bagels, including the Black Russian Bagel, and 20 bagel toppers. Their overstuffed deli sandwiches come with a side of potato salad, macaroni salad, or coleslaw. They’re happy to cater, too, with a giant bagel hand-rolled and filled with meat. Take a look at their website to find out more about their bakery items, knishes, soups, and omelets. Knot Just Bagels has been voted the “Best of the Best” in Central Jersey by the Home News Tribune for nine years and counting. They serve breakfast and lunch, and offer catering services. Their bagel choices include plain, sesame, garlic, onion, whole wheat, everything, salt, French toast, egg, red velvet, and more. Their healthy menus are designed to help those that are trying to get in shape. Check out their website for a full menu and more information. Hot Bagels and More is a little chain with five locations throughout New Jersey, including one in Northfield, two in Margate, one in Atlantic City, and one in Somers Point. Hot Bagels is open every day of the year, including holidays, and offers deli style lunch sandwiches as well as breakfast. Bagel varieties include blueberry, chocolate chip, strawberry, super whole wheat, marble, and many more. The rest of the eclectic menu includes cold and hot sandwiches, subs, wraps, burgers, salad platters, quesadillas, soups, wings, and more, making Hot Bagels the perfect place to bring a group of diverse tastes. Bagel Masters hand-rolls all of their kettle boiled bagels daily. Over 24 bagel options include their banana nut, super cinnamon, apple cinnamon, bran and honey and marble bagels. Mini bagels are available in plain, sesame, poppy, everything, and cinnamon raisin. Other menu items include muffins, breakfast sandwiches, and lunch sandwiches. Bagel Masters has pioneered an innovative school lunch program. Parents can sign their children up for the program online to have bagels delivered to their school daily. Medford Bagel Shop in Medford, New Jersey, is a family owned business and, according to their website, their bagels “are well known throughout South Jersey for their fresh, great taste.” Seasonal cream cheese flavors sets Medford Bagels apart, with flavors like pumpkin every fall. 21 different bagels comprise the menu, including chocolate chip and power bar options. Check their website for free bagel coupons and other promotions. The Bagel Pantry has two New Jersey locations, one in South Plainfield, and one in Metuchen. The menus differ slightly between the two locations, but include breakfast omelets, Panini’s, specialty sandwiches, salads, wraps, and grilled items, like hamburgers. With just under 20 different types of bagels, including rainbow bagels and black Russians, you’ll never go hungry. Order online or stop in to one of their shops today. Bloomfield Best Bagels and Deli in Bloomfield, New Jersey, offers hand-rolled bagels baked fresh every day. The bagel options include cinnamon raisin, Pumpernickel, salt, plain, poppy seed, sesame, rye, garlic, and much more. In addition, consider a muffin, flagel, pancake, or croissant. Their breakfast burritos and quesadillas, served with peppers, onions, and your choice of meat, are quite good, too. The menu is large and varied; check it out and order online, or visit one of their stores.